and the author of four college textbooks, four blogs,magazine articles and pollytalk columns. Her featureson the decorative arts, antiques, collectibles and design have appeared in Art & Antiques magazine. She is alsotheauthor of four blogs: pollytalkfromnewyork;menremarkablevisionaries; womendeterminedtosucceed and poetryfromtheheartbypollyguerin. While retail theater on television is currently celebrating the rise of the department store, viewers would be served better to know that the true story of the man you brought retailing to the pinnacle of showmanship was Potter Palmer. 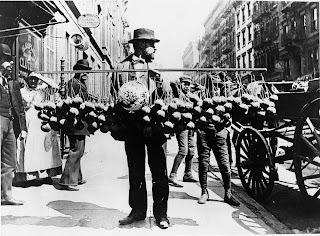 He was the creator of what we now know as the modern department store. (It was not Marshall Field or Harry Selfridge) Palmer ranks highest among the remarkable visionaries who made shopping an adventure and entertainment destination. However, he was more than just a merchant king he also gave Chicago, the grand Palmer House Hotel and many other ‘firsts’ including introducing impressionism to the United States. Palmer's wife, Bertha Honore, shares in the limelight by becoming one of Chicago's most distinguished leaders for women's rights. RETAIL ORIGINS Palmer invented many of the retail practices we take for granted today. He was the first captain of the merchant class to allow women to exchange merchandise. He created the motto, “the customer is always right,” originated a liberal credit policy, opened the bargain basement concept and last but not least installed dazzling window displays. Obviously Palmer influenced other retailers who adopted his successful retail innovations. A man ahead of his time, Palmer hired one of the first female architects to construct a building for the World’s Columbia Exposition in 1892. LOVE UNDER FIRE Such a story is worth historical reverence and to this end Corn Bred Films has set the record straight about the lives of Bertha and Potter Palmer, one of the first and foremost power couples in the United States. Corn Bred's new 30 minute documentary film, LOVE UNDER FIRE, tells the epic love story between young socialite Bertha Honore and Potter Palmer, a self-made man twenty years her senior. Their passion for Chicago, the city they loved is a riveting saga that reveals more than meets the eye. PALMER ARRIVES Potter Palmer came from upstate New York and was interested in retailing. He stopped off in Chicago a burgeoning Midwest town with mud roads but a growing community. Palmer saw opportunity and decided he wanted to be part of the city and prospered in real estate and retailing. After reaching an elevated level of business and social recognition, when he was thirty-eight years old Palmer was worth millions of dollars, a fine catch to say the least. Due to Palmer’s social ascendancy, he was invited to dinner at the home of real estate maven, where Palmer met thirteen year old Bertha Honore, an event that would forever change his life. PALMER HOTEL Bertha Honore was a remarkable woman, determined to succeed and did so in more way than when years later she married Palmer. Palmer was a man of great gestures and he built the Palmer Hotel as a wedding present for his bride. During the raging fire that destroyed Chicago in 1875 and the Palmer Hotel, Bertha seemingly rose from the ashes, a woman of great fortitude. She was the first woman to appear before Congress to petition the government for funds, and traveled throughout Europe, influencing royalty and industrialists. Palmer let Bertha shine in the limelight. She continued to be a great supporter of women’s education, wages and working conditions. This powerful couple’s story is breathtaking and illuminating as to how two people forged a legacy that makes the Palmers important figures in the historic record of our country’s evolution as a great retail empire. There are women born with many gifts and then there is Kathryn Hausman, a woman determined to succeed beyond any obstacles in her path, a woman who went past the glass ceiling and scaled to the heights of success in every field she endeavored. How shall we define a woman of such diverse talents: mother, designer, entrepreneur of Medusa’S Heirlooms, collector and philanthropist, president of the Art Deco Society of New York and glamour icon!!! Hausman manages to toss all her responsibilities in the air and produce a legacy of achievement that is befitting a modern woman. No, not one who came into her success through marriage or inheritance but through personal perseverance and persistence. Hausman was determined to succeed and to make the world a better place. She pursued her dreams and leaves a legacy to inspire other women to pursue their dreams as she did. MEDUSA’S HEIRLOOMS I remember meeting Kathryn many years ago when I was an accessories editor and found the starling creator introducing her hair ornaments and delightful accessories someplace on Third Avenue. And then I followed her to Bloomingdale's where sales were booming and another story was in the works. Striving and surviving throughout the decades and gaining momentum she built a thriving business and still has a big following nationwide, and Bendel’s is her best New York Customer. In her showroom at 385 Fifth Avenue baskets of hair ornaments, barrettes and jeweled accessories spill out from floor to ceiling and sparkle like diamonds, in a treasure trove display where buyers stepping into the magic kingdom descend to place orders of hair accessories for their boutiques and stores. SOUND INVESTMENT Hausman, a single divorced and devoted mother of two sons, invested in her family with unwavering devotion and to this end she said, "With the financial success of Medusa's Heirlooms I did something smart and bought a brownstone on East 89th street for $155,000 in 1978. If one is invited to this amazing home/museum there you will find Hausman's Goldscheider collection of ceramics made in Vienna from 1885 to 1938--gaily painted female figures from the 1920s that depict Hollywood actresses and exotic dancers. So rare and wonderful is the collection that its celebrity was presented in an exhibition “Goldscheider Ceramics---A World Brand from Vienna” at the Leo Baeck Institute, part of the Center for Jewish History at 15 West 16 Street in 2009. In the future Hausman plans to document her Goldscheider collection in a book that no doubt will have profound collectible value. A COLLECTOR'S DEN That’s not all that is housed at Hausman’ s brownstone, in her personal collection drawers spill forth with Bakelite jewelry and with so many other treasures in her Art Deco-inspired interior it is like visiting a petite museum. She is as decorative as her collections. “I always dress a little costomey,” says the iconic designer. “I like vintage clothes or a bit of eccentricity.” A loyal friend with unwavering faithfulness, Kathryn seems to have the ability to put other people’s interests and needs before her own, and to this end she has also mentored young students from the Fashion Institute of Technology who have the opportunity to learn the accessories business first hand in her Medusa's Heirlooms' showroom. ART DECO SOCIETY PRESIDENT Kathy Hausman has been involved in the Art Deco Society of New York for over thirty years. She says, “I joined the Board as a shy, young Deco advocate and served as a Board member for many years and later was elected to be the Social Director producing great parties and balls at prestigious private clubs and venues. When Bill Weber, who was president for years and my inspiration became ill I was elected vice president and in the following year, 1999 I was voted in as president.” Hausman’s role became even more demanding and in 1997 she represented and attended the ICAD’s Congress in Los Angeles. She was so inspired that she proposed at the ICAD’s 2001 Congress in Tulsa, Oklahoma, an official offer to host ICAD’s Congress in New York City. The vote was unanimous!!! ICADS NEW YORK CONGRESS In 2005 drew 250 attendees from all over the world to experience New York’s Art Deco treasures. Scholarly lectures, parties and historical New York venues were orchestrated by Hausman in places of extraordinary historical reverence. I remember the Australian contingent and never met friendlier and more enthusiastic attendees but there were many other Deco international friends and this congress set the stage that recognized Hausman as a born leader on the world stage. DECO GOALS FULFILLED Dawning on the heels of her success and after serving as President of ADSNY, Art Deco Society of New York for over 15 years, Kathryn Hausman leaves a legacy of achievement that cannot be matched by many other women. As she said, “I am not leaving! I will sail perpetually on the ADSNY ship, but will no longer be at the helm.” Hausman’s Medusa’s Heirlooms continues to be one of New York’s eminent accessories firms. The Art Deco Society of New York, on the other hand, will never be the same, for under Hausman’s administration the organization was imbued with heightened awareness of the Art Deco significance of New York’s treasures and the events were always a sensation, a rare opportunity of expand one’s appreciation of Art Deco. THANK YOU KATHRYN HAUSMAN, A MODERN WOMAN DETERMINED TO SUCCEED WHO RAISED THE LEVEL OF ART DECO APPRECIATION. SHE LEAVES A LEGACY OF CONSIDERABLE ACHIEVEMENT THAT HAS INSPIRED AND ENRICHED THE LIVES OF SO MAY DECO ENTHUSIASTS. Alice Austen’s white cottage still stands at the water’s edge in the neighborhood of Clifton on Staten Island--- a testament to Alice’s long and remarkable life as a photographer. Born into comfortable circumstances Alice had no need to pursue a career, but photography, that started out as perhaps a hobby, became her passion. A young woman determined to succeed; Alice deserves her due recognition as a pioneer in this genre. FIRST LADY OF THE LENS She was one of America’s earliest and most prolific female photographers and over the course of her life created 8000 images. For one thing in the late nineteenth century, cameras were a cumbersome affair, but Alice surpassed any restraints and managed to carve a niche in the photography world with images that preserve a myriad of subjects. She captured the great transatlantic ships that still pass in front of her house, the coming of the automobile to the beginning of tennis, the countryside and world beyond. 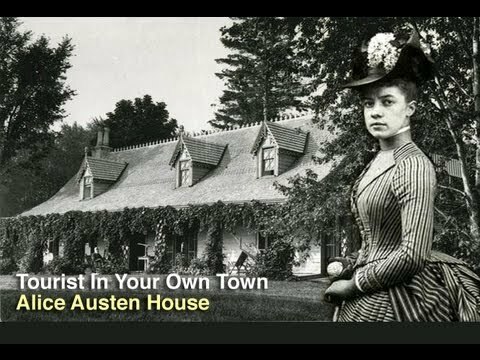 The Alice Austen House Museum, Clear Comfort, is located at 2 Hylan Blvd., Staten Island, New York. FROM SOCIETY BELLE TO PHOTOGRAPHER It was her Danish Uncle Oswald who brought home a camera in 1876 and her Uncle Peter who showed her how to develop the negative images on the dry plates she exposed. Alice was captivated by the new art form and advanced forward with alacrity. However, Alice always insisted, that except for these initial demonstrations, she simply “learned by doing.” By the time she was eighteen, Alice was a professional photographer and her family was sufficiently comfortable to indulge Alice in the best of the cumbersome equipment she required. A closet on the second floor was converted into Alice’s darkroom. Ships sailing the Narrows were her favorite photographic subject---over the years she saw and recorded them all---racing yachts, schooners, tugs, warships, luxury liners and immigrant ships from the vantage point of Clear Comfort, a Victorian Gothic cottage on the shores of the Verrazano Narrows. LAUNCHING A NEW CAREER Most belles during Alice’s time would not have taken on such a demanding task as photography was not a lighthearted affair. Wearing her Sunday best, a bustle fashion gown with striped over skirt one can only imagine how difficult it may have been to photograph the fine old houses and historic buildings on the island. It was not an easy adventure--at the same time lugging around fifty pounds of photographic equipment. She hauled her camera and tripod along to picnics, masquerades and chronicled the social life of musical evenings in her friends’ parlors as well as family gatherings and weddings. She even climbed a fence post, not caring if she exposed her ankles, in pursuit of the picture she wanted of local auto speed trials. POSING HER SUBJECTS Alice would go to almost any length of get the picture she wanted. She was rather a perfectionist and she did not care how impatient her complaining subjects became. The expression of her subjects and the overall composition had to be just right and the exposure in the right light. She enjoyed recording Americans at work, boat races, amusement parks, country fairs in Vermont and the great world fairs in Chicago and Buffalo. She may have spent more than twenty summers aboard and always traveled off the beaten path to capture the activities in some tiny town and she felt equally free to visit places considered unseemly for a lady. Alice usually traveled with two cameras capable of producing images of different proportions, which filled a large steamer trunk. It was a cumbersome affair but Alice was a strong woman capable of carrying her heavy equipment creating in her lifetime images with lasting beauty that chronicle a legacy from America’s past. 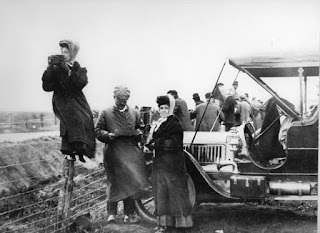 Alice Austen used her camera in a very personal way to record people, places and interesting travels. Her photographs show us real people and places as they actually appeared and we are made luckier by the fact that she captured these images of a wonderful time in America’s history. I suggest that you also read:: ALICE’S WORLD, The Life and Photography of an American Original: Alice Austen, 1866-1952 by Ann Novotny, Chatham Press, Old Greenwich, Connecticut. Polly loves to hear from her readers, please send your comments to pollytalknyc@gmail.com.